The Fourth of July is one of my favorite holidays. I love coming up with Fourth of July menu ideas, thinking about what we can make on the grill or whether we should have potato salad or coleslaw as a side. But putting together the main and side dishes often leaves me little time to think about patriotic desserts. We usually settle for plain ice cream to finish off the meal, which is nice, but this year, I wanted to do something a little nice…and more fun for the kids. 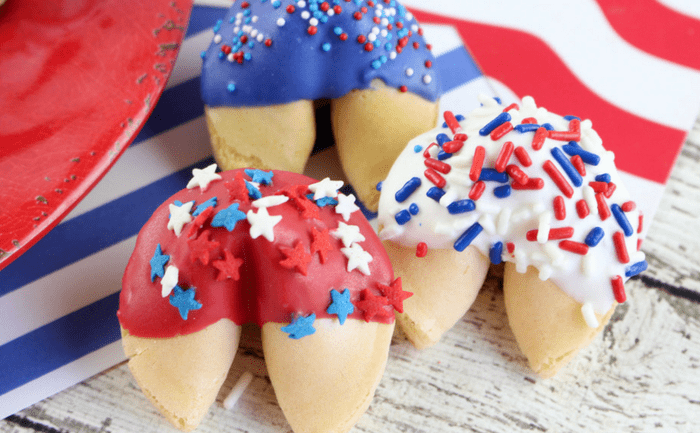 These patriotic fortune cookies are not only super easy to make, but they are so pretty to look at, not to mention a whole lot of fun to eat too! All you have to do is take some store-bought cookies, melt some colored candy, sprinkle on some jimmies, and your special dessert is ready to go…it’s so easy, even the kids could make these cookies! 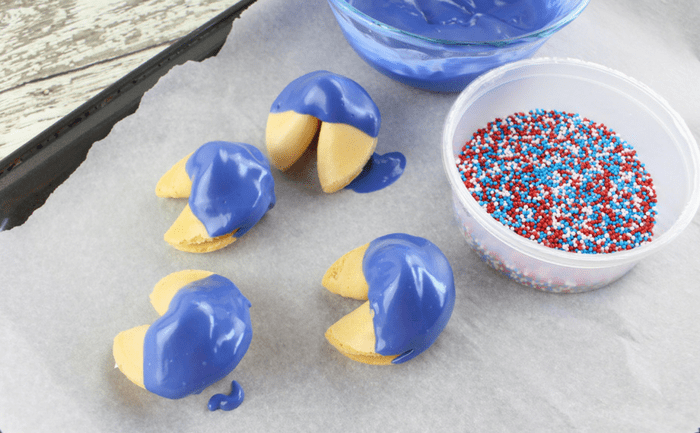 First, gather up all the ingredients for the cookies…you’ll need store-bought fortune cookies, blue candy melts, white candy melts, red candy melts, red, white and blue nonpareils, red, white and blue jimmies, and star sprinkles. Begin by placing the blue candy melts in a microwave safe bowl and heating in the microwave for 45 seconds. Stir until melted and smooth. In the meantime, line a cookie sheet with parchment paper to hold the finished cookies. The parchment paper will help the cookies to come up off the pan easily after the chocolate hardens. Dip 4 fortune cookies into the melted blue chocolate and place back on the lined cookie sheet. 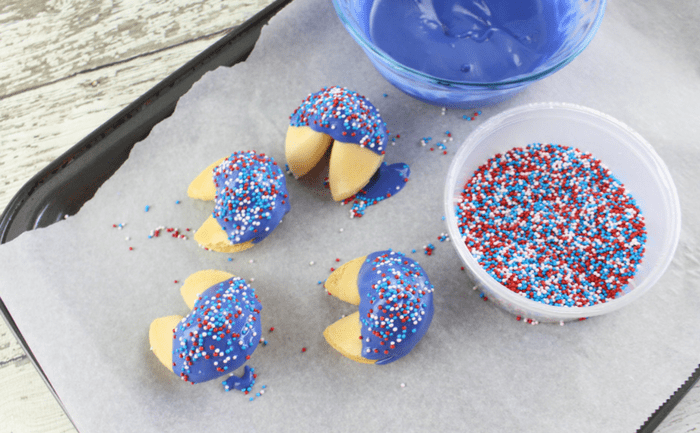 Immediately sprinkle with the patriotic nonpareils sprinkles before the chocolate hardens. Repeat the process with the white and red candy melts, sprinkling the cookies with the jimmies and stars before the chocolate sets up. 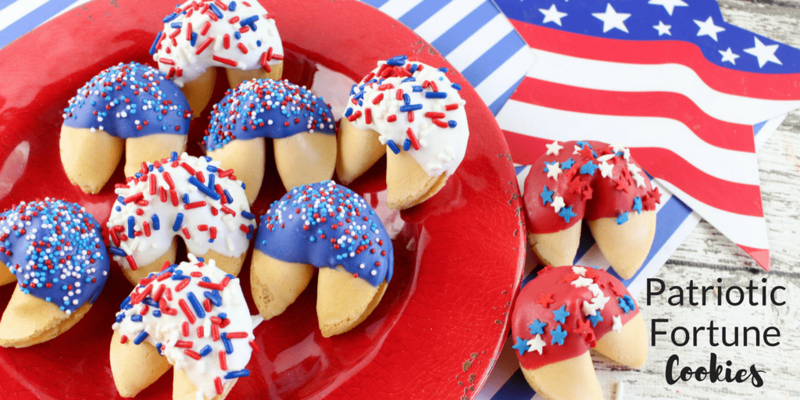 When you’re finished, you’ll have a dozen pretty red, white and blue dipped cookies! Line a cookie sheet with wax or parchment paper. Set aside. Add the royal blue candy melts to a microwave safe bowl and microwave for 45 seconds. Stir until melted and smooth. Dip 4 fortune cookies into the melted blue chocolate and place back on the lined cookie sheet. Immediately sprinkle with the patriotic nonpareils sprinkles before the chocolate hardens. Microwave the white candy melts for 45 seconds. Stir until melted and smooth. Dip 4 of the fortune cookies into the melted white candy and return to the cookie sheet. Sprinkle with red, white and blue jimmies sprinkles. Microwave the red candy melts for 45 seconds and stir until melted and smooth. 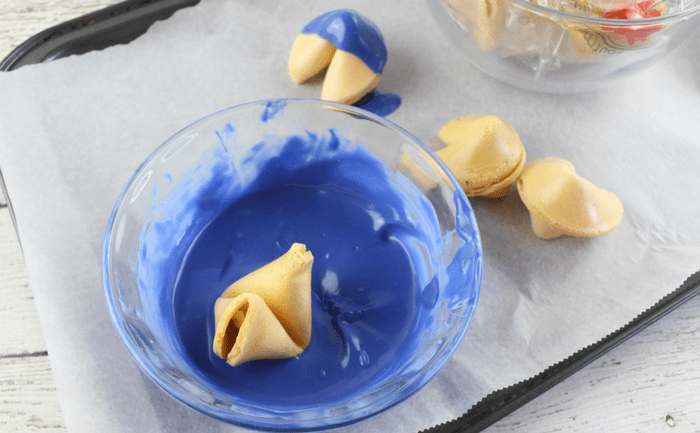 Dip the remaining fortune cookies into the melted red candy and place back on the cookie sheet. 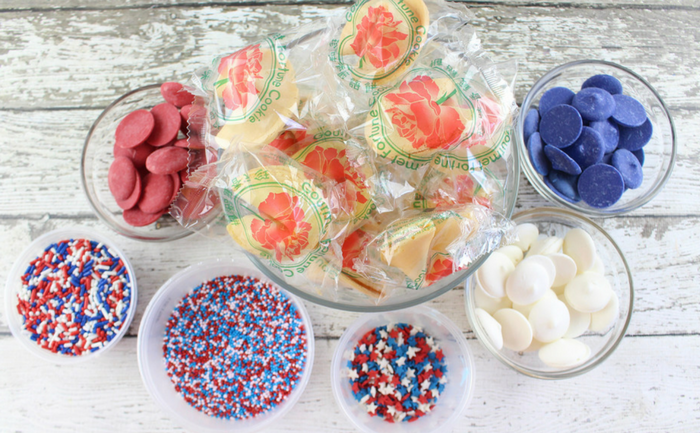 Sprinkle with patriotic star sprinkles. Wait 15 minutes for the chocolate on the cookies to harden before serving. Makes 1 dozen cookies. It’s just as easy to make 2 or 3 dozen of these cookies as it is to make 1 dozen, so if you have extra candy melts, why not make a really big batch to share with friends or neighbors? They also make a great addition to a potluck, and can be served for Memorial Day and Veterans Day in addition to the Fourth of July. 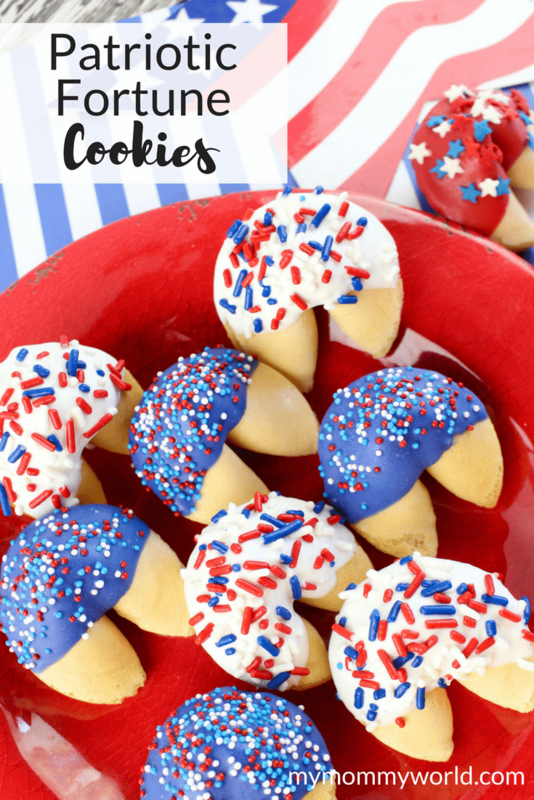 I hope you’ll try making this easy patriotic dessert! I love how easy these are to make and they look so patriotic too. I know my kids would love them. Thanks for sharing your recipe. These are so fun!! I love those candy melts – my grandma used to use those and make special candy for each holiday. Thanks for sharing for the #HomeMattersParty ! The candy melts are so versatile and can make so many fun treats!